As you unfortunately likely noticed over the past few weeks, our service has been a bit choppy at times. We wanted to clarify what happened, and why we had to go through this. We’ve been providing our tools to Yahoo! merchants for a little over 8 years now and over that period of time, our tools have grown and morphed, meaning our technological needs have also grown – and morphed. Plus, technology in general has also evolved. So after all these years, it was time for us to undertake a complete infrastructure review, which we did late last year. It quickly became apparent that there was some better hardware out there that we could use to improve our service, and so we embarked on the long journey of migrating all our existing hardware to new equipment. We held off on doing that last fall, to avoid any disruption during your very busy holiday season, and only got around to it in late february. The process didn’t go as smoothly as we had hoped and expected. We apologize again for the bumps and issues you were subjected to over these few weeks of migration. We want to assure you that we did everything that we could to make the transition as smooth as possible, but have learned quite a few tricks and gotchas that will make the next migration – in another 8 years, hopefully! – much smoother than this one. 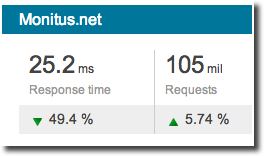 That being said, we are very happy to announce that the move, although bumpy, was worth it: our service’s speed has gone up 40-50%. The new hardware will also allow reports to be generated a bit faster, as well as offer better capacity for the big holiday season and other traffic spikes. We thank you very much for your support and patience, and hope that you feel the difference and benefit from better serving times. As for us, we are now moving on to improving our tools and offering you even more goodies. We are always working with you guys in mind, trying to find new ways to make things better and easier for you and your business.